Features the official report from the bipartisan Commission on the Intelligence Capabilities of the United States Regarding Weapons of Mass Destruction--named by President Bush to try to prevent similar policy debacles in Iran and North Korea. It also includes the official speeches, United Nations reports, and declassified government investigation reports that show, step by step, how the United States got the crucial question of arms in Iraq so terribly wrong.  American inspectors sent in after the war in 2003 found no weapons of mass destruction and how they--and Washington insiders--began to question the basis of the prewar intelligence. The New York Times editor and contributor to The 9/11 Investigations (PublicAffairs, 2004) Craig R. Whitney has scoured the documents surrounding the search for Iraq's weapons of mass destruction. In The WMD Mirage, he has assembled the most revelatory and pertinent of these. The result is a startling narrative trail that leads readers through the intelligence and misinformation leading into Iraq--and a telling portrait of how the Bush administration, whether deliberately or unintentionally, with scant evidence and largely against the will of the international community, convinced the American people and their few allies of the urgent need for war. A must-read for scholars, voters, and anyone interested in the goings-on in Iraq, the growing threats perceived elsewhere, and the truth behind our frayed international reputation, The WMD Mirage offers the real story of the missing weapons of mass destruction. 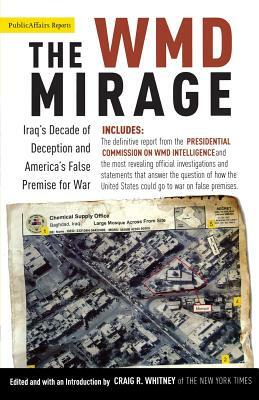 In offering such a clear-eyed and documented picture of how we got it wrong in Iraq, The WMD Mirage is the first widely-available book that also includes the new conclusions of the Presidential Weapons of Mass Destruction Commission.